Over the course of the past year we have had the opportunity to learn much of the culture of evangelicalism in Guatemala. It has been a fascinating study, and God has given us the opportunity to put our analytical skills to use! We wanted to share what we have learned with you so that you have an understanding of the context of where we are working. This context is necessary to understand some of the upcoming changes in our ministry focus. Like most other Latin American countries, the Spanish settled and colonized Guatemala in the 1500’s. Naturally, the Spanish introduced a certain flavor of Roman Catholicism which was prevalent in Guatemala for years. At the same time, there was, and still is, a heavy dose of indigenous mysticism and animism rooted in the local Mayan ancestry. Generally speaking, Guatemalan religion suffers from large amounts of syncretism—the blending of organized religion and indigenous beliefs. Nevertheless, evangelicals have been in Guatemala for almost a century. The first evangelical missionaries were invited by President Justo Rufino Barrios in the late 1800’s. However, despite their early introduction, Guatemala remained largely Catholic until the 1970’s. While I have no experience with these “evangelical” churches in their initial stages, I will briefly outline my experience with them, as they exist now. Much of this information has been gathered largely through hundreds of conversations with local Guatemalans about their church experiences. Almost every person I encountered has had a church experience that includes one, if not more than one of the following four marks. Many of them have experienced all of them. There are few Guatemalan pastors who have been trained to study and teach the Bible. The problem is not that these pastors have been trained poorly, it’s that they have no training whatsoever. This often results in a twisting of scripture for the expedient use of the pastor. Many of them preach the Bible in complete ignorance. People with no training can certainly teach and preach. However, they will almost always teach and preach what they have been taught. As you read the rest of the document, you will hopefully understand why this is such a big issue. There are two particular ways in which their lack of training is displayed. First, pastors have no grasp of biblical hermeneutics. Not understanding the differences between the original audience of the books of the Bible, pastors encourage their congregation to claim promises of Scripture that never applied to them in the first place. Things like “God wants to expand your territory” or “God has plans to prosper you and not to harm you.” On top of that, these promises are taken as promises that will be fulfilled personally and specifically instead of corporately through the person and work of Jesus Christ. Second, many pastors don’t prepare for the delivery of their sermons. With the high emphasis on the supernatural, some pastors trust that the Holy Spirit will give them the words and the message that they should preach. Having no plan, no course, and no understanding of how to teach God’s Word, pastors fill the ears of their congregants with heresy and false teaching contradictory to the gospel of Jesus Christ. This biblical illiteracy then becomes a perpetual problem: pastors who don’t appreciate the Bible teach their congregants to under-appreciate the Bible. A pastor that understands how to exegetically explain a verse of the Bible is a rare gem. The average Guatemalan, no matter their demographic, has little to no experience reading or studying the Bible on their own. Hierarchy and authority are important values in Guatemalan culture. Guatemala is a country that has been ravaged by economic poverty, military oppression, and civil war. Historically, Guatemalans were conquered and then enslaved. The average Guatemalan’s sees himself as a follower, a servant, someone with little to offer to the world around them. Due to this “follower mentality”, Guatemalans are looking for someone to follow and for many people, the pastor has filled that void. Pastors have become the life-coaches for many evangelicals in churches. Subsequently, pastors have become men with extreme power and extreme authority. Unfortunately, it’s not at all uncommon to find pastors who abuse that power. I’ve heard countless stories of pastors who receive foot massages from different women in the church before giving messages. Pastors who expect people to respond when he prophesies over them and accept his prophecy. Pastors who lock the doors of the church building during services so that no one can leave. Pastors who walk around the congregation recording how much money people gave to the offering. Many of them, sadly, have crowned themselves as “the anointed leader” which is not too far from Catholicism’s own claim to papal infallibility. Well-known pastors are rumored to have multiple families, avoided criminal charges, and have gotten away with much of it because they are the “ungido de Dios”—God’s anointed leader. This corrupted view of pastoral ministry only hurts the people surrounding them. This pastoral authority perpetuates all sorts of issues in the every-day life of the congregants. They do and say certain things only because “the pastor said so.” Their lives are not informed by God’s Word, as mentioned above, rather they seek and follow the pastor’s guidance for most of their life’s decisions. The reformation doctrine of “the priesthood of the believer” never really made it to Guatemala. Therefore, the pastor holds all the authority. People from different cultures see the world through different lenses. In the United States we have a tendency to be pleasure seeking, efficiency-loving rationalists. We see the world as a series of opportunities to capitalize for our own pleasure or gain. We are often skeptical of anything that is not measurable, tangible, or visible. Guatemalans are quite the opposite. Having a cultural lens that is rooted in their Mayan ancestry, Guatemalans are more open to the metaphysical or supernatural. Many have stories of experiences with angels, demons, and God Himself. 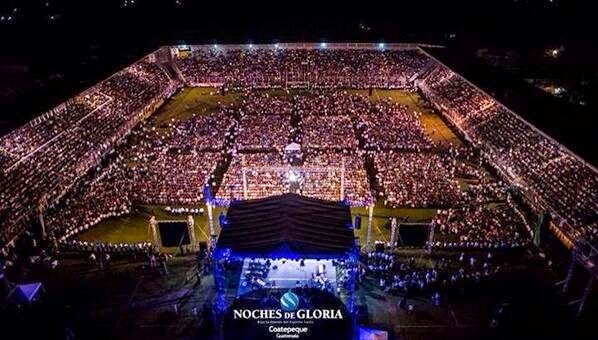 An aerial picture of one of the glory nights of healing held in Guatemala. Healing services are a common and almost expected experience. Huge healing rallies take place multiple times a year through a variety of different churches. Exorcisms, prophesy, and speaking in tongues are all highly valued occurrences among the evangelical community in Guatemala. Some may even go so far as to say that these are the means of assuring that God is with us, He is active, and His favor rests upon us. The spiritual experience, for many, is not characterized as what Eugene Peterson would call, “a long obedience in the same direction.” The spiritual experience must be characterized as more and more extremely intense supernatural and spiritual manifestations. 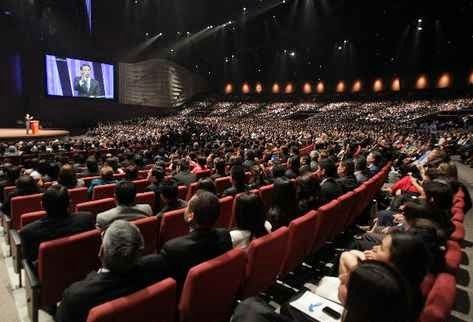 A large percentage of the evangelical culture in Guatemala has adopted the language of Pentecostal churches. Church leaders refer to themselves as Apostle _________ or Prophet ______________. Many of these prophets or apostles have done much damage in the name of their spiritual gifting. Their use of spiritual gifting is similar to the pastoral authority mentioned above. They claim a kind of power that transcends them and gives them the freedom to speak into the lives of other people. Often, these prophecies are life altering to the recipients. Yet, many of these prophecies are not actually fulfilled. Many of the “apostles” and “prophets” do not settle down in one congregation and establish a track record, rather, they are more easily compared to traveling charlatans prophesying huge amounts of success and financial gain for church members, and then leaving before anyone can determine if it was true. If the prophecy is not completed, as we will mention below, it is almost always blamed on the individuals lack of faith or sin. Two prevalent concepts, that go hand in hand, are the word of faith movement and the prosperity gospel. The word of faith movement teaches that God’s blessings are ready to be delivered; all that one must do is claim them, especially out loud. In the United States we would refer to this movement as “name it, claim it” theology. The prosperity gospel, often referred to as the “health and wealth” gospel, is a movement that argues that God’s central desire for humans is that they be physically healthy, materially wealthy, and happy. Preachers of the prosperity gospel teach that by doing certain things like giving financially, or as they call it “sowing into their ministry”, they will secure blessings from God. One of the most popular phrases you’ll hear is, “God wants to open the windows of heaven and let his blessings rain down.” Believers are encouraged to pray for the things that they already desire and claim that God wants to give it to them. They are also encouraged to sow into the preacher’s ministry so that they may reap God’s blessing. Many of the people that live in poverty or in sickness are told that they are, in fact, in that situation due to their own lack of faith, or sin, and must give more. The prosperity gospel and the word of faith movement are in direct opposition to the gospel of Jesus Christ. Rather than communicating that humans are sinners in need of redemption and reconciliation, the prosperity gospel encourages humans to use God to satisfy their own desires. God is merely a means to an end for humans to get what they want. It is a movement that ignores large parts of the Bible, and manipulates other parts to fit their own arguments. prosperity gospel. They see close to 25,000 in attendance weekly. Although Guatemala claims to be 40% evangelical, some studies say the number is upwards of 60%. Sadly, those statistics are misleading. When they say “evangelical” they don’t mean centered on the euangelion or the gospel. They essentially refer to these non-catholic religious events. With a few exceptions, these non-catholic, religious events are shaped by the 4 marks above. Claiming to be evangelical in Guatemala is tantamount to claiming to be Christian in the United States. It doesn’t reflect any specific system of belief. As sad as it is to admit this, many Guatemalan evangelicals have been deceived into believing that they have found life in Christ. Instead of reconciliation with God, many Guatemalan’s have been taught by their pastors to seek blessing, or the miraculous, or prosperity. For many, it is not God that they seek; it is an experience, a seemingly powerful word from a prophet, or a blessing that will release them from suffering or economic turmoil. 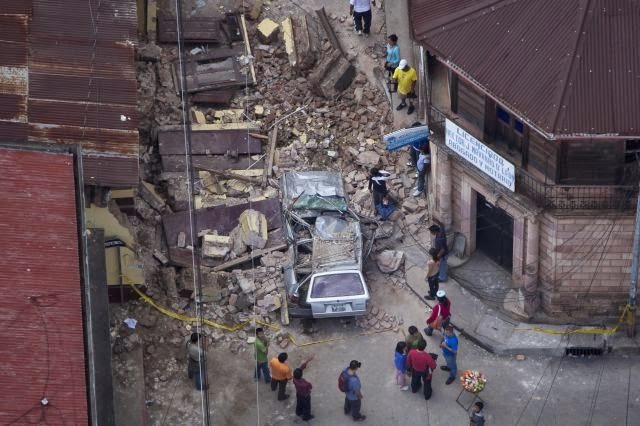 Please continue to pray for Guatemala. Pray that God would open doors to proclaim the true gospel of Jesus Christ. Pray that, as the gospel of Jesus Christ is proclaimed, people’s minds and hearts would be opened to the beauty of the cross. Pray that people would see the real beauty of the true gospel of Jesus Christ. Pray that Guatemalans would learn to treasure Jesus Christ, crucified and resurrected, above all things.